DD Form 3009 - also known as the "Route Classification" - is a Military form issued and used by the United States Department of Defense. The form - often incorrectly referred to as the DA form 3009 - was last revised on February 1, 2016. 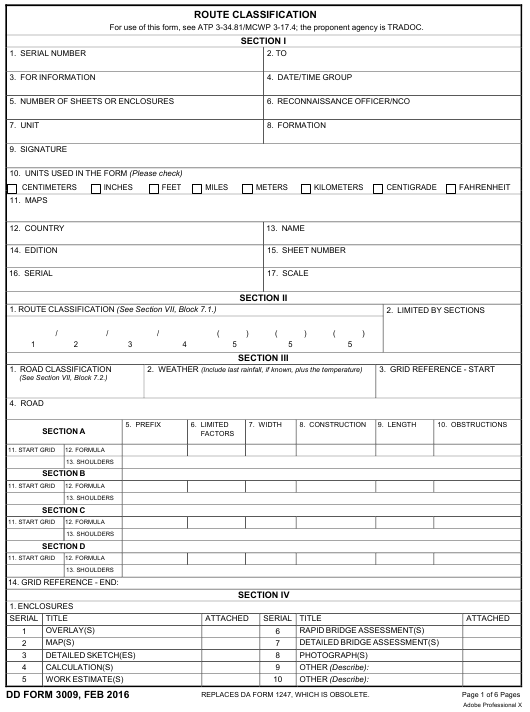 Download an up-to-date fillable DD Form 3009 down below in PDF-format or find it on the Department of Defense documentation website. For use of this form, see ATP 3-34.81/MCWP 3-17.4; the proponent agency is TRADOC. REPLACES DA FORM 1247, WHICH IS OBSOLETE. The width of the narrowest part for any given section. Fair weather route - quickly impassable in adverse weather. The maximum MLC of the vehicle which can use the route in convoy. obstruction. Only included if height is less than the required for the MLC. Regular, recurrent and serious snow blockage. Regular, recurrent, and serious flooding. 7.2. FACTORS USED IN ROAD CLASSIFICATION FORMULAS. One or more limiting factors. Gradients of 7 percent or over. Unstable, loose, or easily displaced. Likely to cause heavy vehicle to skid or drag towards roadside. Indeterminate or doubtful conditions expressed with ? and (). For example, (f?). No symbol, but written reports should specify. Width of travelled way or total width including shoulders (when they are usable). Water-bound macadam, crushed rock or coral. Bituminous surface treatment on natural earth, stabilized soil, sand-clay, and so forth. Natural earth, stabilized soil, sand-clay, shell, cinders, and so forth. Various other types not mentioned above. The length of the section in kilometers may be added in brackets if desired. Symbol at the end of the formula indicates existence of obstruction. Regular and sufficiently flooding which impedes traffic flow. Overhead clearance less than 4.3 meters. Reductions in road widths which limit traffic capacity, such as craters. Gradients of 7 percent and over. Curves with less than a 25-meter radius and deflecting more than 90. Limited access. Up to 3.5 meters wide; it permits passage of isolated vehicles in one direction only. Single lane. From 3.5 to 5.5 meters wide; it permits use only in one direction at any one time. Single flow. From 5.5 to 7.5 meters wide; it permits isolated vehicles to pass or travel in the opposite direction to the main flow. Double flow. Over 7.3 meters wide; it permits two columns of vehicles to proceed simultaneously. 7.3. MEASURING THE RADIUS OF AN EXSISTING CURVE. Step 1. A chord AB is set out as shown and bisected at C, so that AC = BC = a. Step 2. From point C, the perpendicular offset (x) is measured at point D on the curve. Step 3. The radius is calculated from the formula.